SATURDAY, July 1, 1961 was a cool, overcast day in Melbourne, as one would expect at that time of the year. The temperature was 13 degrees Celsius at noon, but a biting wind made it seem colder. On that day this writer travelled by train to Glen Waverley for the first time. At 15 it was a new experience and the reason I ventured there was to watch a football match between the new VFA club Waverley and Camberwell. After catching a bus from the corner of Mont Albert Rd and Elgar Rd, Mont Albert, I boarded the train at Holmesglen station which was hardly a showpiece among suburban stations. The journey to Glen Waverley lasted barely 10 minutes yet this short time span was full of interest. Leaving Holmesglen by way of a bridge above Warrigal Rd, one had a good view of the busy thoroughfare below. The train was one of the red Tait variety and its motors seemed to work hard as it climbed to the next stop at Jordanville, crossing Huntingdale Rd on a high bridge as it entered the station. On arrival the motors seemed to sigh with relief that they could have a brief rest after working upgrade. The railway was still a single track in this part of the world and Jordanville, as far as I was concerned, was an apology for a railway station. I was used to far more impressive suburban structures such as Box Hill, Glenferrie, Canterbury, Ringwood, Essendon et al. Nevertheless it was fascinating to see a different aspect of the suburban network. Pulling out of Jordanville one noticed the Riversdale Golf Club with its rolling greens to the north of the line. Because of the elevation of the railway you could observe the splendid vista of the growing suburbia towards East Burwood. The line continued to climb, reaching more than 400 feet (121 metres) above sea level as it came appropriately to Mount Waverley. This time the train left the station beneath a bridge. The bridge carrying Stephensons Rd above the railway was a rather quaint wooden structure, which was extremely narrow and was replaced by a four-lane bridge not so many years later. Running along level ground, the railway passed beneath another bridge at Lawrence Rd and then descended to Syndal, crossing Blackburn Rd by a high concrete bridge. The line climbed as it ran parallel with Coleman Pde before making a further descent to the terminus at Glen Waverley. 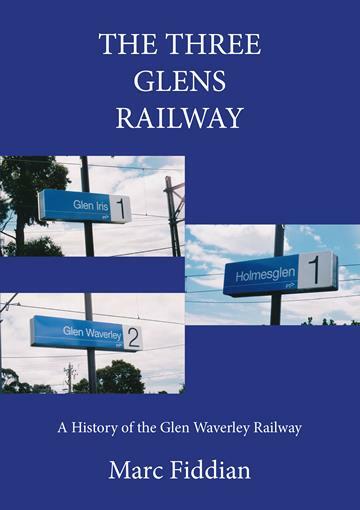 The Glen Waverley station was a wooden structure, more in keeping with a country branch line, which dated back to 1930 when that section of the railway opened. On walking out of the station, which was only 50 metres or so from Springvale Rd, Railway Pde as it was then named was deserted. By now it was past 1.30pm and the shops had closed, leaving you with a desolate feeling. If I had to put music to the experience of arriving at Glen Waverley, the opening bars of a rather melancholy song of that era called Town Without Pity, sung by Gene Pitney, would be most fitting. This completed my first use of a train to Glen Waverley. A year later I repeated the journey and on this occasion had an instructive time in the waiting room at the station on the return journey. There my attention was drawn to a row of muddy shoes, mostly women’s, which probably belonged to commuters who had to walk along unmade streets to reach the station. Once they reached dry ground they obviously changed into something clean. The Glen Waverley of 1961-62 (and the section beyond Darling) was more in keeping with the opening of the railway three decades earlier. For my part I was joining the tail-end of the pioneering days of Glen Waverley’s rail link with Melbourne. Perhaps it was fortuitous I did so because the Glen Waverley of the mid-1960s was entirely different. The trappings of an unimportant terminus had been changed forever with a makeover that looked good but was actually an Americanisation with car-parking the all-important focus. The rebuilding of the station and its surrounds truncated the line by some 150 metres, but who cared? Some of us did although the overwhelming feeling in Victoria at the time, be it the metropolitan area or the country, was that railways were an anachronism. They belonged to the past and those who still travelled by train should be grateful for whatever they were given. Railway users were beggars and they had no right to be choosers.